Fungi (or Morels as it also know) is a game about collecting delicious mushrooms and eventually cooking them. Of course, someone else is on the hunt for those tasty treats. Who will be the best fungal chef in the end? 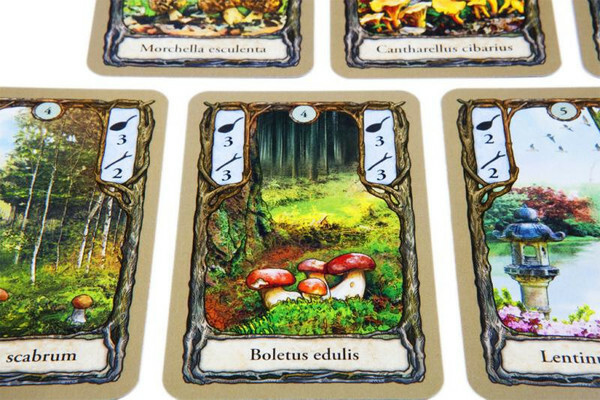 Fungi is a game about collecting mushrooms from a dynamic, ever-changing drafting pool. All mushroom cards look the same: you get the mushroom name and their selling and cooking values. You can only ever cook the same type of mushrooms together, and their cooking value are the victory points you get when cooked. Each type has a night version which is worth twice as much. Selling the mushrooms gives you walking sticks instead, which you use to venture further in the woods: taking cards further away on the draft pool. The rest of cards are used to increase value when cooking (cider, butter), increase your hand size, or the frying pans, which are where you cook the mushrooms (you need one each time you want to cook). The draft pool is refilled every time a card is taken or moves to the decay. Cards move out into a decay pile from the draft, and players can either get the cards on the decay pile, or from the forest. When the decay pile gets the fifth card, the other four are removed from the game. The game ends when there are no more cards in the forest. There is always the same set amount of mushrooms, so it is important to keep in mind the remaining cards, and what has disappeared from the game through decay. 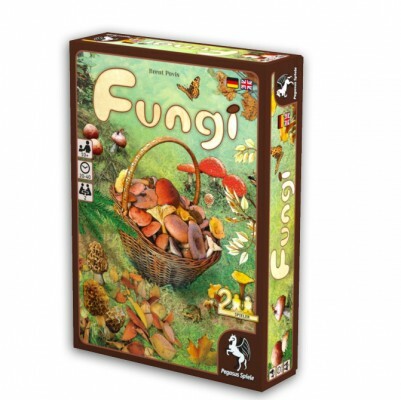 Fungi is a great 2-player game. Easy to set up and pleasant to look at, with a good duration. As most drafting games, it offers tons of replayability, and it is deep enough to allow for different strategies. The downside: the constant refill of the draft pool is… intense, and makes passing turns physically slower. Coming out on top of the mushroom cooking requires careful consideration in drafting, playing pans, or taking the decay. The draft fills at a frantic pace, and keeping track of the collections is essential for success. Marc is a 20-something(-something) driven by stories, in any format: books, games, movies, scribbles on a napkin,... you name it! He prefers bluffing/deception games, but will play anything, really.